What do your Property Managers help with? Your property manager is here for you before, during, and after your stay. Their work starts prior to your arrival. They are available to discuss the area, questions of the home, and any recommendations or local knowledge you may need. They are also in charge of your “pre-arrival home inspection,” which occurs after our housekeepers are finished cleaning the home, and after the housekeeping inspector checks the home. They are our 3rd level of quality control and they are there to make sure it is set up perfectly for you. Included in that is a small welcome gift that your manager will put together for you to welcome you to Siesta Key. Every welcome basket is different, and it is designed based on their communication with you and what they think is perfect for the vacation you have planned. Once you’re here, unlike a hotel, with a concierge in the lobby, our manager comes to you. They meet guests within 24 hours of arrival, preferably at the time of your arrival, so that they can walk you through the home and show you how to use the systems in the home, especially items like elevators, remotes, and pool controls. Before and during your stay, you can contact your property manager team member. Each person is assigned to specific homes in our Siesta Key and Lido Key property management company, but they all work as a team in the event one team member is off work and an issue arises. They handle any and all guest relations items during your stay. They offer recommendations on restaurants, nightlife, rental equipment and tours, adventure activities, and general local advice and knowledge to help you have the exact vacation you want. We can’t wait to be your vacation host. Kelly was born and raised in Fountain Hills, Arizona, but always had a dream of living in Florida. She has worked in the Property Management Industry for over 10 years and she strives to provide the highest level of guest satisfaction. 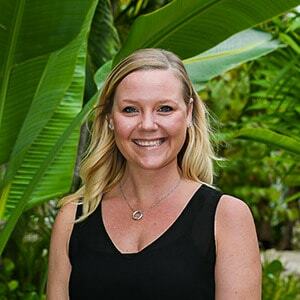 Kelly recently moved to Siesta Key, and not only did she fall in love with the stunning beaches and architecture, she also found it to be one of the most charming, beautiful, family-oriented places to live in. In Kelly’s free time she loves to golf and explore different areas of Florida. Let Kelly go above and beyond your expectations to make your vacation stay with Siesta Key Luxury Rental Properties a memorable one! Dana was born and raised in New Jersey, and recently moved to Florida to enjoy our beautiful area and year around sunshine. Dana is extremely glad she made this decision, and she will tell you when you speak to her that she is loving every second of living here and being able to work at such a beautiful and amazing place! Dana’s education background is in Hotel and Restaurant Management, as well as additional education in Graphic Art Design. These skills have helped Dana and all of the guests she hosts benefit from her experience. When she is “off the clock,” Dana enjoys her hobbies in graphic arts and photography. Dana loves her role and she cannot wait to assist you on your stay. She will go beyond your expectations to make your stay memorable! What are our guests saying about it? Here at Siesta Key Luxury Rental Properties, our guests and their vacation experience with us is so important. Because of that, we’ve added a BRAND NEW service to our rental program designed to help guests have a stress-free vacation. We had an amazing stay at this property with our children and grandchildren. The location couldn’t be any better. We were a short walk to the beach and an equally short walk to the village. Even our 2 and 3 year old grandchildren could comfortably walk back and forth. There is a market in the village, which we visited at least daily to pick up those few items that we seemed to need to restock. The pool area was amazing. While the first floor bedrooms are aa bit on the smaller side, they each have their own bath and the beds were very comfortable. Only odd thing is that there is a lot of activity on the one side of the house because an outside shower, a bathroom and laundry area located for the resort guests, but we got used to it. When I first booked this property almost a year in advance, there wasn’t a washer and dryer in the house. But I called on two separate occasions, asking that they please consider adding. I felt for the price of the house and the number of guests, they should be included. Happily, they were put in before our stay!! Billy, our concierge, was very attentive and helpful as well. Would highly recommend for a family gathering!! The unit was beautiful with plenty of space for our two families. We’ve stayed at many places in Siesta Key over the past 10 years. This place was top notch and by far the best stay we have ever had. Customer service was excellent. When the laundry facility closest to our unit wasn’t working, Dylan from Siesta Key Rental Properties helped me to get my clothes clean, folded, and delivered to my unit so I didn’t miss a second of beach time. INCREDIBLE! The unit was beautiful, beds were comfortable, and it was super close to the beach and Siesta Key Village. It was perfect for our two families totaling 4 adults and 5 kids. Our extended family of 14 stayed here for a family reunion and loved this house. The location is fantastic, near to beach, restaurants and shops. The pool, slide and hot tub were a winner. And the rooftop deck was amazing! It’s beautifully decorated and a great layout of rooms for multiple families and groups. Rental concierge stopped by to make sure everything was good. So glad we stayed here!